IT’S FINALLY HERE! 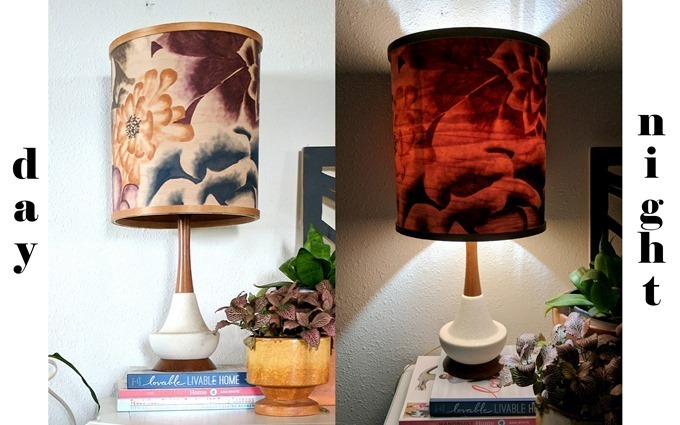 The stained wood veneer lampshade! If you watched our Facebook Live(s) you know that we’ve been recording/editing video for my latest stain art! 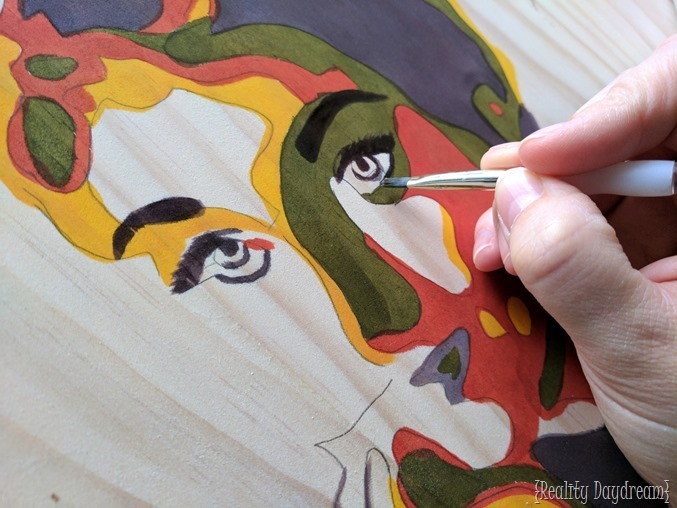 And this time instead of staining onto a solid piece of wood furniture, I actually stained my art onto a thin sheet of wood veneer. Birch to be exact. And then we (Nick) made it into a LAMPSHADE! I’m pretty sure this idea came from an intense brainstorming session that my friend Dana and I had. We often get on a creative kick, and rapidly throw ideas back and forth. Sometimes it’s in person… sometimes it’s via Facebook messenger. We call it ‘Brain Vomit’. And when it happens, there’s no control over what comes out of our mouths. 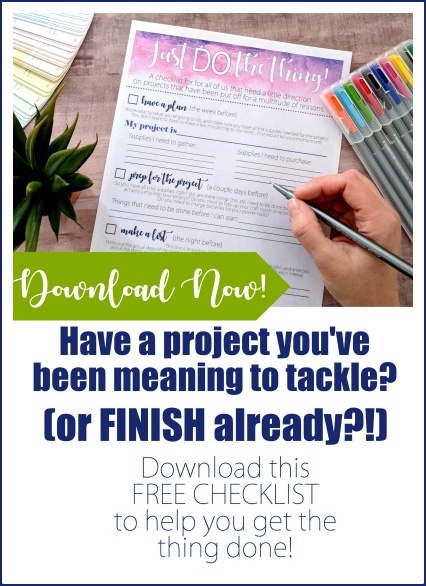 I’m convinced EVERYBODY needs a creative brainstorming buddy. It’s amazing. 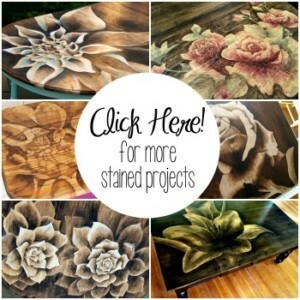 The first thing I did was find a design to stain onto wood. As long as you’re not planning to sell your piece, it’s ok to use an image from the internet. 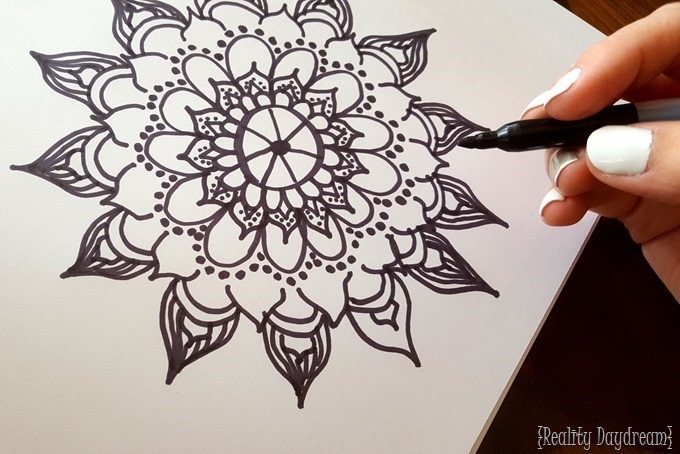 Print it out in black and white, and then lay a transparency over it and trace with a fine-tip sharpie. 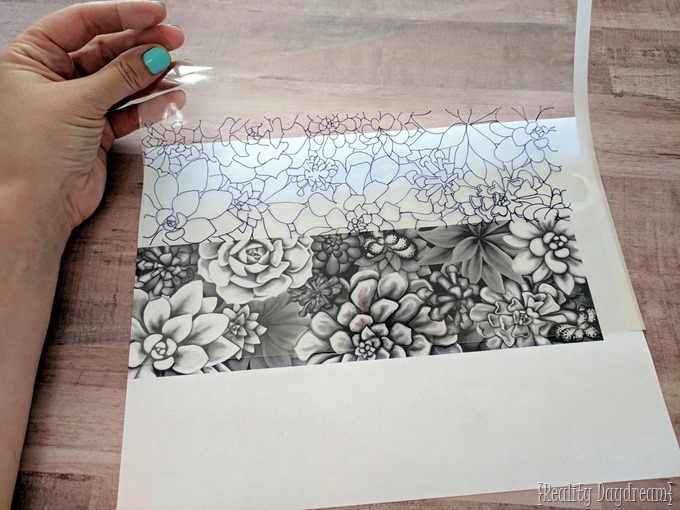 You could just print the image right onto the transparency. I’ve done it both ways and just prefer the tracing method because then I know exactly which lines I want to trace. Sometimes when things are blown up, they look muddy and you’re not sure what you’re supposed to be tracing. 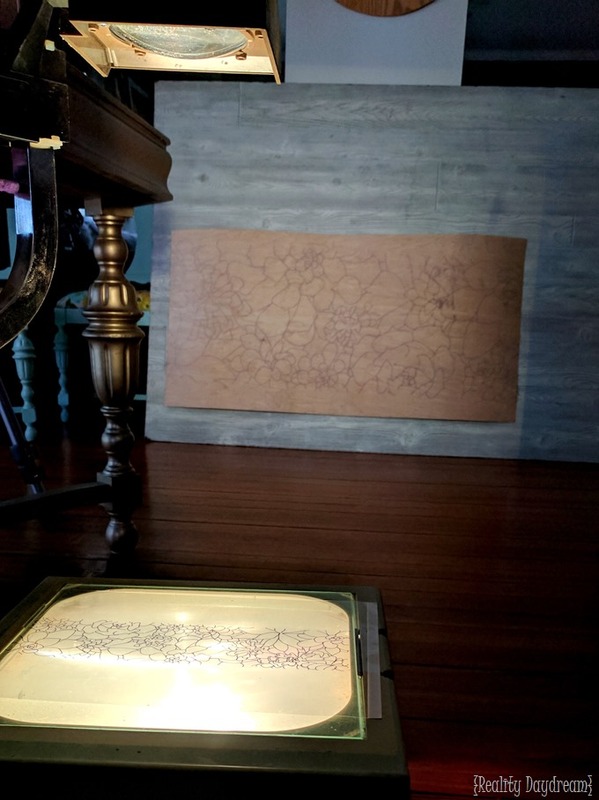 Place your transparency onto the overhead projector (if you don’t have one, try checking with your local library!) 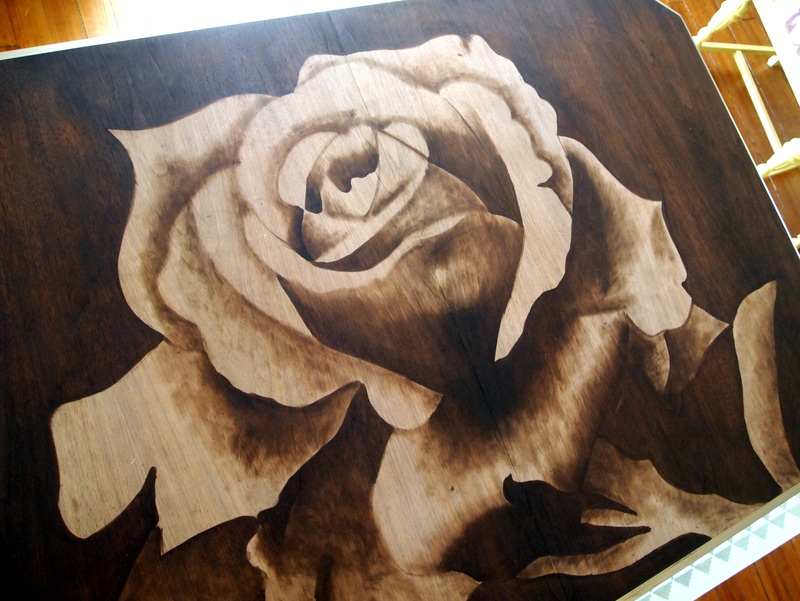 and project the image up onto your sheet of wood veneer. 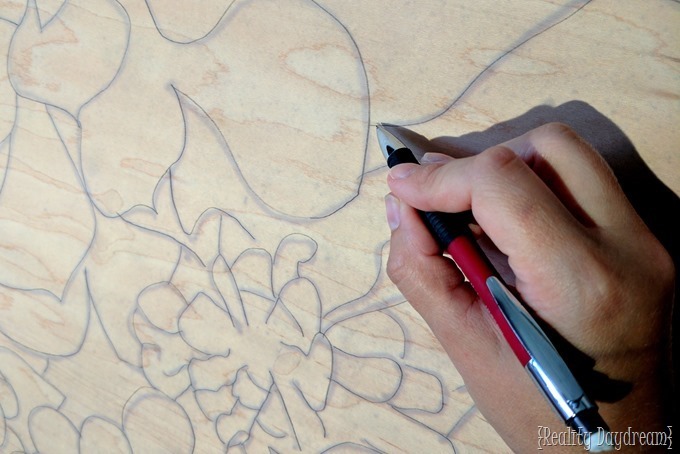 Trace the design onto the veneer with a pencil, being mindful to press lightly. You don’t want a dark line! Now we’re ready to STAIN with our Mohawk Ultra Mark Stain Pens! They have a huuuuuuge variety of shades, most of which are neutral wood tones. But get creative and choose ones that will really pop and contrast with each other! One benefit of using stain pens is that they cut down on ‘bleeding’ dramatically. Bonus! 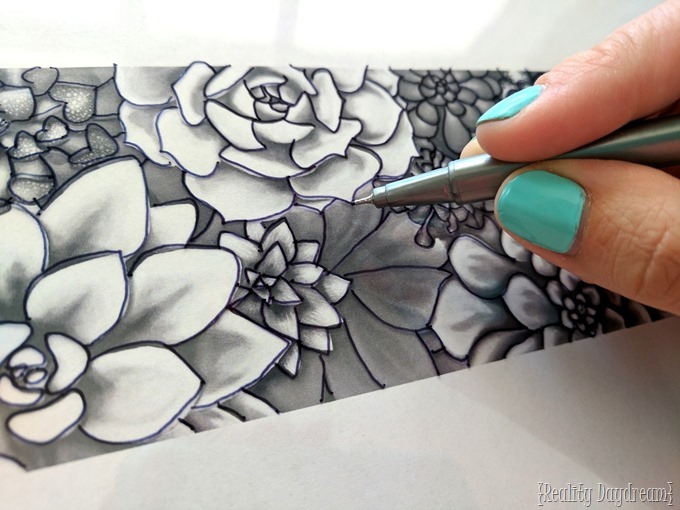 I have a detailed beginners tutorial for Shading with Stain here, and more complex tutorials here for those that are a little more advanced with this technique. It’s easier than it looks! I promise! To see a slower, more in-depth version of that video, be sure to watch my Facebook Live I did during the process. 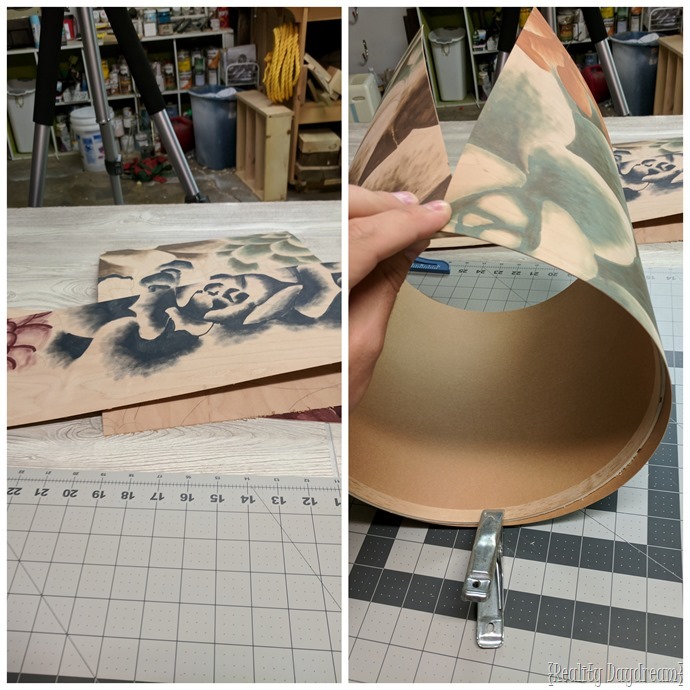 Now that I’m done with the staining process, it’s time to make this sucka into a lampshade! 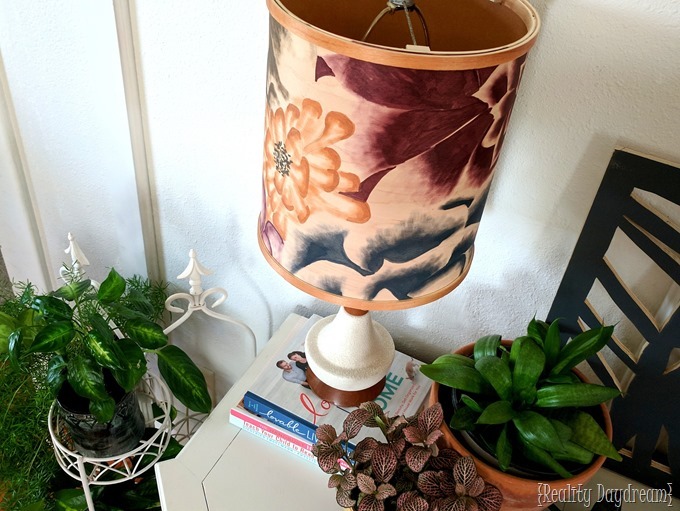 We have a cute vintage lamp that we love, and decided to use it’s old lampshade as a template to make a new one. We bought two embroidery hoops as close in diameter as the lampshade as possible (ours were a little bigger, but we’ll touch on that in a bit). 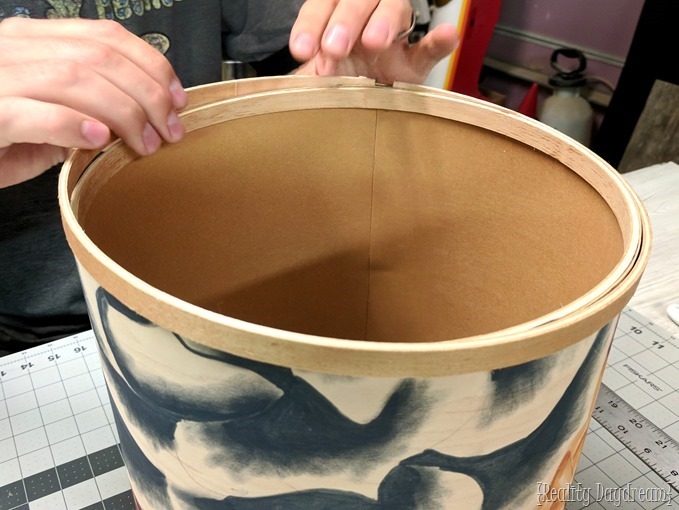 Measure the height you want your lampshade and the diameter of your embroidery hoops with a fabric measuring tape, and mark out where you’re going to cut your design out. 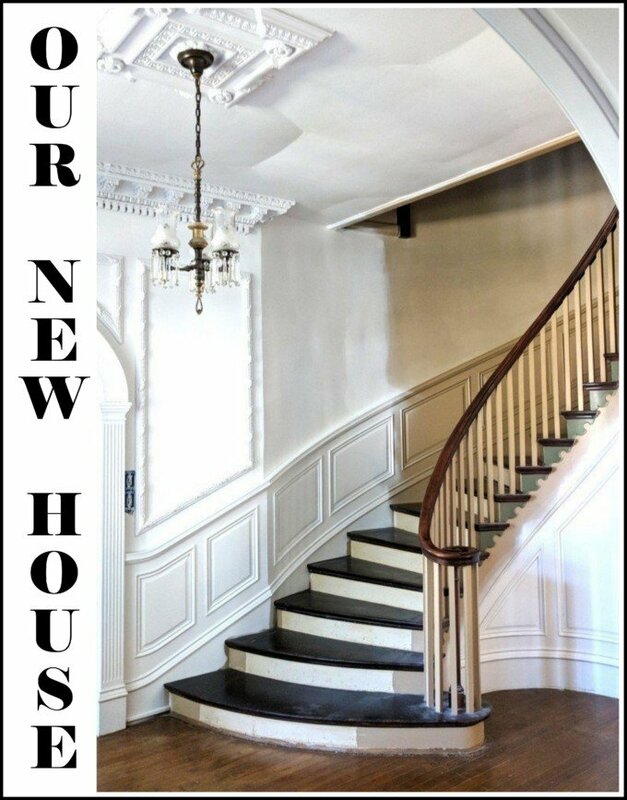 Make sure you take into consideration which parts of the design are your favorite so you can be sure they’ll show! 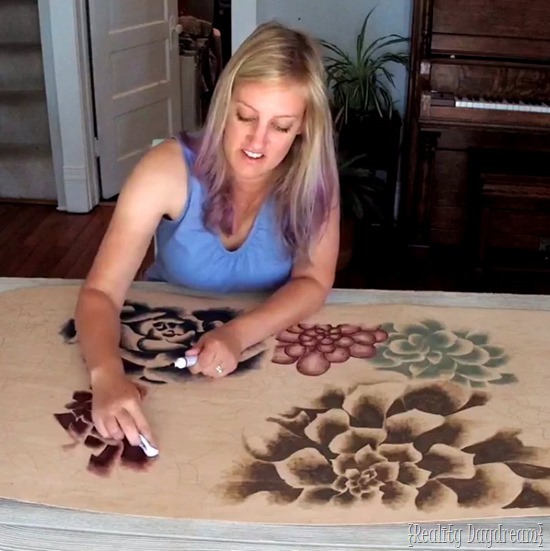 Cut using a rotary cutter or utility knife and a straight edge. 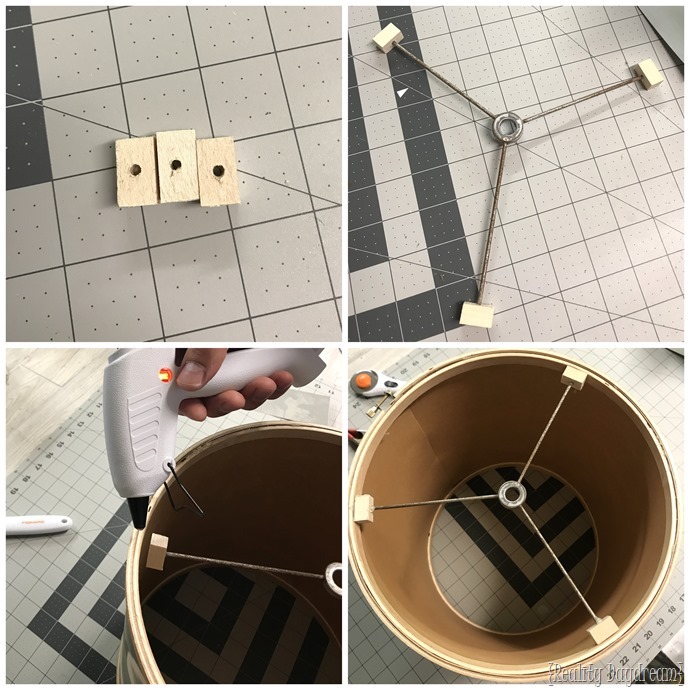 Take your embroidery hoops apart so the two circles are separate, and start gluing the edge of the veneer around the INNER circle. Then slide the outer ring of the embroidery hoop over the top and tighten ‘er up! Repeat on the other side, and glue up the side seam. Nick also did a Facebook LIVE sharing this process, so you can access that here if you need more explanation. Now because our lampshade is a bit larger in diameter than our ‘template lampshade’, we had to modify the metal part we’re stealing off it. The arms weren’t long enough to extend out and reach on all sides, so we used little wooden blocks with holes and it worked swimmingly! 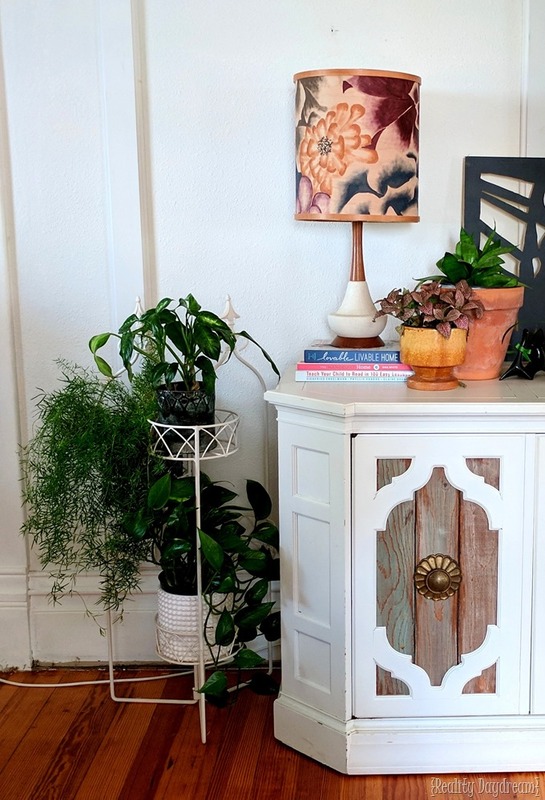 I love the design element that it adds to the room. Definitely a conversation piece! There was a LOT of anticipation about how this baby would look all lit up at night… and we weren’t disappointed! 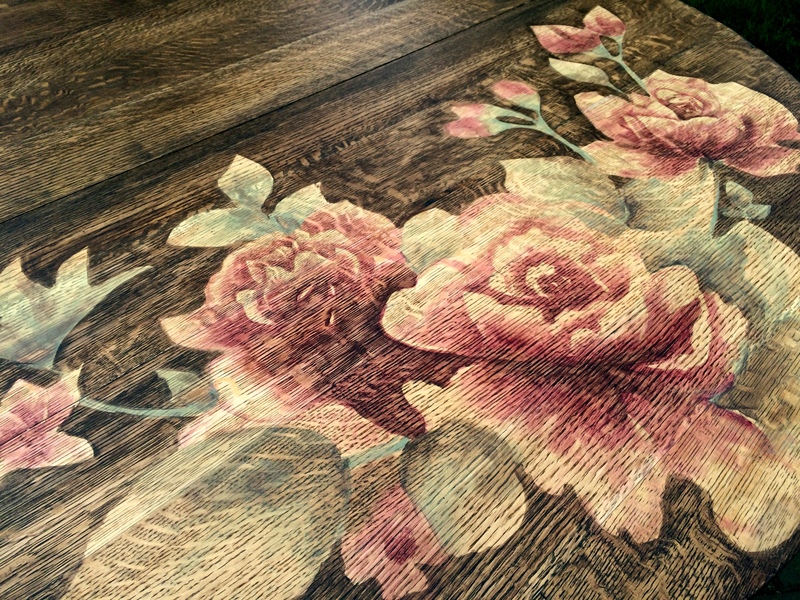 I mean, it doesn’t light up a room or anything, but the woodgrain shines through beautifully, the colors of the flowers are vibrant (although the image below doesn’t convey that). This lamp falls squarely in the ‘mood lighting’ category. 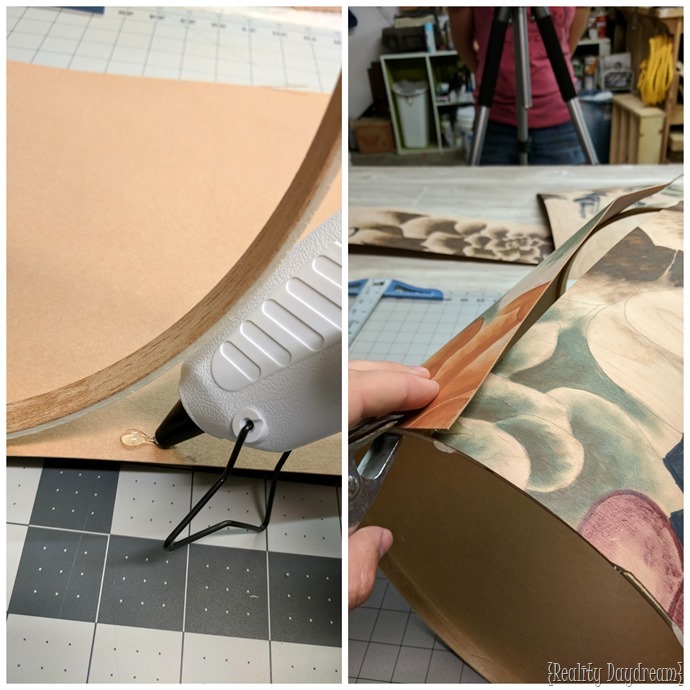 This project took us out of our comfort zone a little bit, because we’ve never worked with wood veneer before, and we’ve never build a lampshade from scratch! 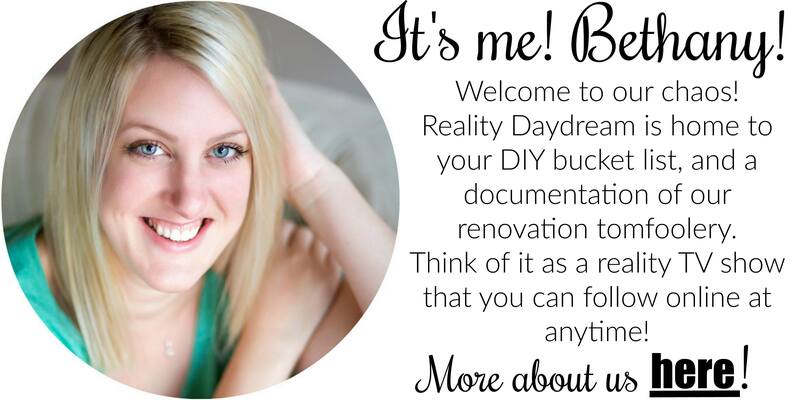 But it was a FUN process, and we worked out all the kinks so you can have a smooth process when you make yours! i just loved the way you have did it..
As always … Just Beautiful!! !